When I walked in the door at Guy’s, I wasn’t quite sure what to expect. Up front is just a simple seat-yourself bar and bar tables with stairs leading up to a larger seat-yourself bar and bar table area. To your left you’ll notice the ‘gift shop,’ by which I mean a wall of t-shirts, books, kitchenware. The exterior walls of the elevator behind the host counter on one side declares “Welcome 2 Flavortown” with little angel wings around the 2, and on the other has the constant mantra of Mr. Fieri, “Love, Peace, and Taco Grease.” A sign standing in the bar informed me of Monday night trivia, where you can test your knowledge of “all things Guy!” Cases of PBR and Rolling Rock tallboys are displayed proudly at the top of the bar, among various scattered American flags, hanging pots and pans, an amalgam of which seems to make sure all three words of “Guy’s” “American” and “Kitchen” are all equally represented within your eye-line at any given moment. When we got to our table, it was wide with comfortable chairs and white linen… covered in a big sheet of brown paper. We were situated in one of the two dining rooms behind the larger upstairs bar, this one called “The Studio” and the walls covered with various guitars, ads for guitars, and ads for other products that featured musicians (next to our table was an Apple ad featuring John Lennon and Yoko Ono.) All of this to me speaks to a mindful understanding of the kitsch that comes with the brand of Guy Fieri, who spends a good portion of his time driving around the country in a ’68 Camaro eating cheeseburgers. For the sake of brevity I’ll just link you to the menu here. It’s not quite as bizarre as other publications might lead you to believe, but it is really interesting. There’s a large number of things on the menu will make you feel as if you are ordering something intended for children (in my case the Bacon + Chicken Mac and Cheese) but there’s something that sounds appetizing for almost everyone on there. The PPW is a little tricky here, as I believe they do it by weight and not count, but I can only give info based on what we were served, which means the Bourbon Brown Sugar wings (9) are $1.55, and the Buffalo Blu-Sabi (10) are $1.49. We went ahead and ordered both kinds of wings, and some dinner to go along with it. We also ordered a few of the signature house cocktails because why wouldn’t you? It’s clear they put a lot of work into presentation here, and it pays off. Each plate came with the wings in a perfect stack on black plates with sauce drizzled over top and a smattering of green onions. With each was a stack of veg, including cucumber, celery, waffle-cut carrots, and radishes (which are fast becoming my favorite veg for wings) and a plastic ramekin of dipping sauce. I’m tempted to take a knock at it for the clear plastic ramekin on an otherwise gorgeous plate, but at that point I’d think that I was looking for something to complain about. There’s no use denying that they look amazing, 5/5. JC said these were a “little too sweet for my taste, but tasty.” JF found them to have a “mild BBQ taste” with “not a lot of flavor” and “not a lot of sweetness.” AK on the other hand thought they were “pretty good! I don’t ever eat wings because I hate having bones in my mouth, but those were some tasty bones!” For my part, I can definitely say that the brown sugar definitely shined through in this sauce, but that’s about it. They were sweet, but the sugary sauce didn’t add the usual crisp that they tend to do. The bourbon seemed non-extant, and there wasn’t any significant BBQ flavor that would define this in any other way. It doesn’t exactly fail as a sauce, except that it fails to succeed. 2/5. “Just normal,” started AK, “and that’s disappointing! They’re not terrible, or surprisingly good, or whatever! They’re like the wings at TGI Fridays – they do the job.” JF said he couldn’t taste “anything special in the sauce, certainly not any of the [advertised] ingredients.” He also found that there was “some grittiness to the sauce, unnervingly gritty a times.” JC said they were “kind of like a regular Buffalo wing, but with a bit more of a jalapeno kick.” This is a decent Buffalo sauce, and after a couple wings it does build to a heat that I would tick just above medium. I don’t think the ‘bleu-sabi’ dip added anything to the experience, especially nothing in the way of wasabi. It’s a safe wing with a very middle of the road flavor. Did he say safe again? Yes. Yes I did. And you know what that ends up meaning. 3/5. The failing of the Bourbon Brown Sugar wasn’t enough to weigh the overall sauce down, so we can call this an overall 3/5. The wings themselves might have been the most successful part of the whole endeavor. They brine them as a means to bring some crispiness to the skin, a tact which in this case mostly worked. They are decently sized and consistent across the board. The insides are meaty and flavorful with little to no charring or rubbery bits, making for an overall really good wing. 4/5. I just wanted to put here that while I’m not a huge fan of Guy Fieri’s cuisine or television shows, I cannot deny that he is an incredibly hard-working professional, and I believe that he has done more than enough to earn his audience and his fame. Not too long ago I read a break down of how he shoots Diners, Drive-ins, and Dives and while I wouldn’t call it eye-opening, it did a great job illustrating the ethic he puts into what is essentially the same thing I’m doing, which is reviewing places around the country that people may not have otherwise known. Granted, my audience is much smaller and the biggest reason for the unknown-ness of the places I’m going to is mostly due to locale and not that nobody has heard of them, but the point stands. Regardless of what I think of his wings, I have a lot of respect for the dude. Now for the business at hand. Honestly, this is a measure of expectation versus reality, and while I always do my best to temper any preconceived notions I might have of a place, this was probably my hardest challenge. I walked in wanting these to be really good, to break the mold and defy expectations after the different jokes and jibes this place has taken. I really wanted these to be great wings, but… they’re just OK. They’re a touch expensive but not abnormally so. The sauces are decent and inoffensive. This wings are tasty but not exactly exemplary. Like the décor, it just sort of screams at level of mediocrity, and embraces it the whole way through. 3/5. Spring has spring, and the MaxFunDrive just finished up. Thank you to everyone who came out to both meetups. I wasn’t able to make the second one but I hope it was nearly as fun (it was surely just as rainy) as the first one. If you’re new to MaxFun NYC, then welcome home! If you’re interested in joining the Wreview, shoot me an email! Know of a place you want to recommend we try? Pin it in our recommendation thread here! We’ll see you next week, and don’t fall for anything dumb today! 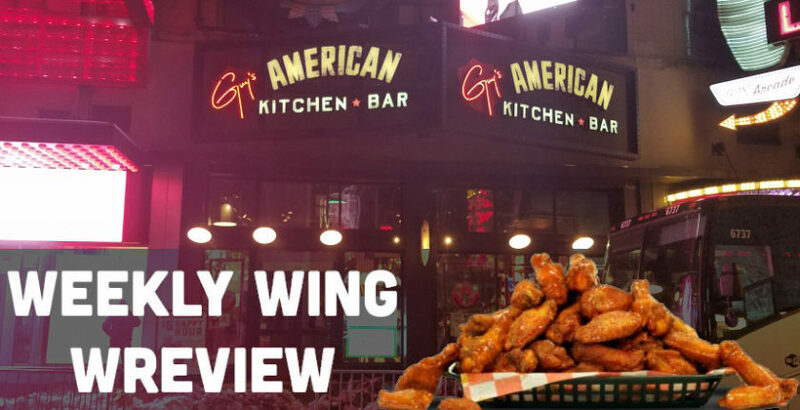 As always, the Weekly Wing Wreview and MaxFun.nyc are not affiliated with Maximum Fun or its associated products or brands. But we’re pretty big fans. If you're at a parade and you see a guy with a cooler selling colorful juices in unlabeled plastic bottles, don't buy them for your kids. They're "nutcrackers," fruit juices mixed with either hard liquors or self-made spirits. Buy them for *yourself*.